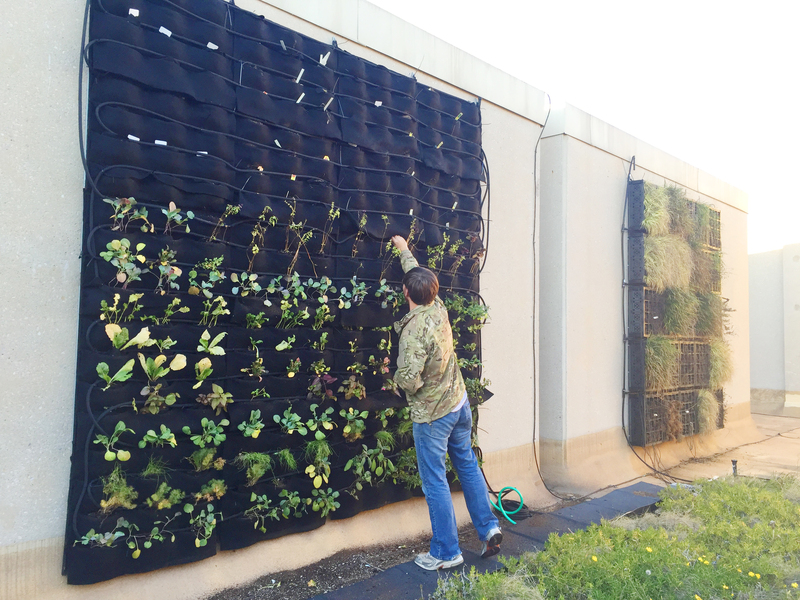 This time we will work on the living wall. The first step is to install irrigation system from the inlet of water. 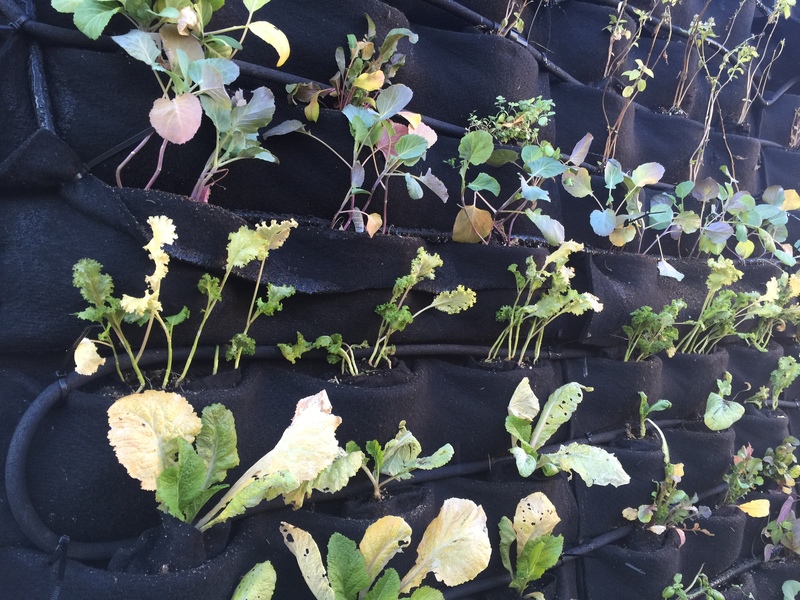 And arrange the irrigation pipes along the upper side of each planting bags on the wall. After installation of pipes, we need to take out the existing blankets with old soil inside in the each bag to empty them and wrap the plants with them. Then put the wrapped plants into each bags. Our basic principle of arranging plants is based on theory that short plants on the bottom, tall plants on the upper layer and same plant species are arranged together side by side. However, the process of putting plants into the bag is really a tough work due to the restricted space provided by bags, which is really difficult to squeeze the plants into such a small space. Also the space above bag is also small which makes the leaves of plants bend outward. So in my opinion, the distance between upper side and lower side bags can be wider. Overall, the green roof internship in this semester is almost done. I really learned a lot from these practical operations of selecting plants, making soil base, planting vegetation and acquire some knowledge about the installation of irrigation system, which would be a greatly valuable experience in my life. I hope this project can be continued in the future. And we also added new nine modules for growing proposed crops. In making the substrate and filling soils in the module, firstly we put a layer of substrate to fill the holes in the modules, and a square blanket was used to cover each modules on the top of substrates. 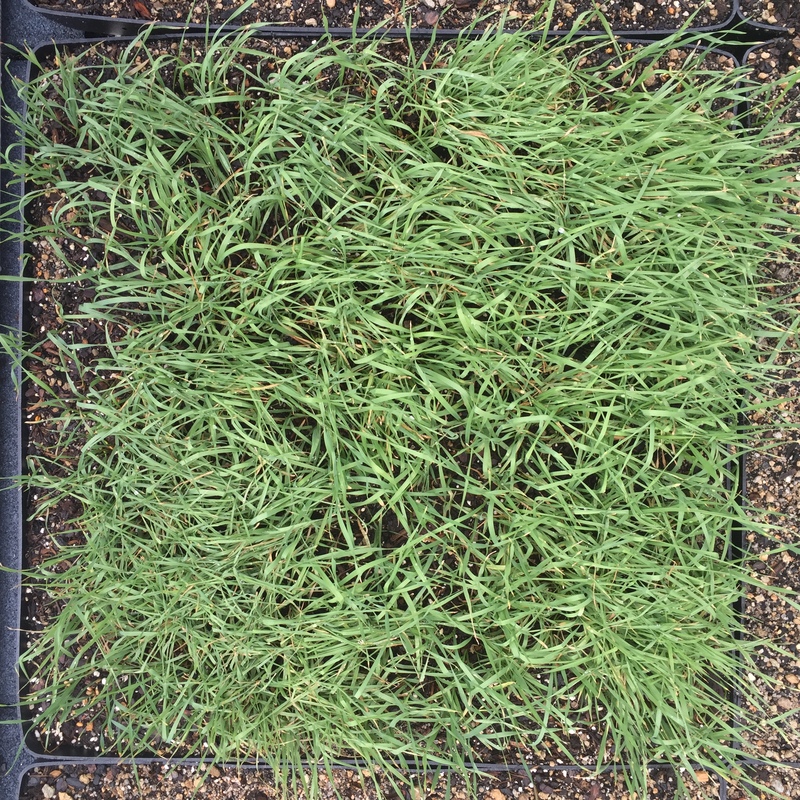 And soils for growing vegetation are put on the top of blankets. The texture of substrate soils is coarse which can contribute to positive drainage within the modules and the texture of topsoil is finer than substrate soil and it is opulent with organic matter and water content. Then the most interesting part came! 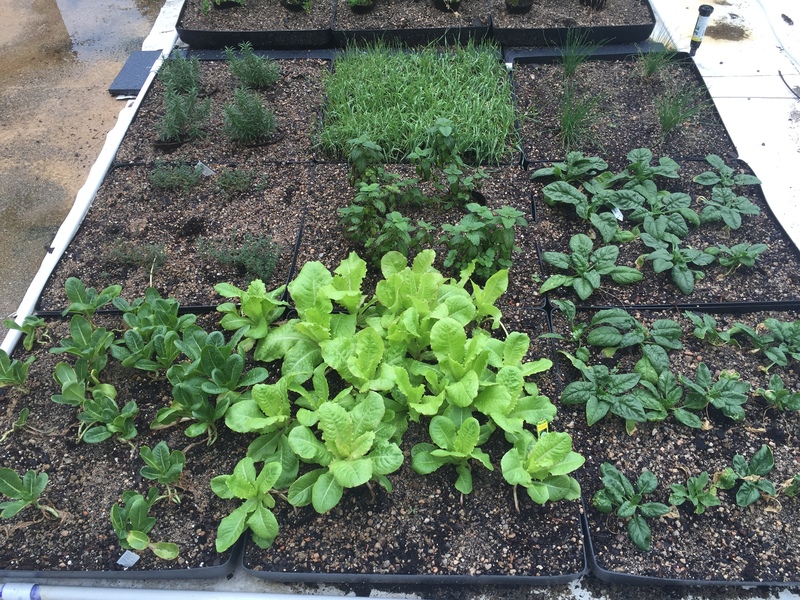 The transplanted and seed crops arrived, which included Arugula, Chives, Cilantro, Mint, Shallots and so on. 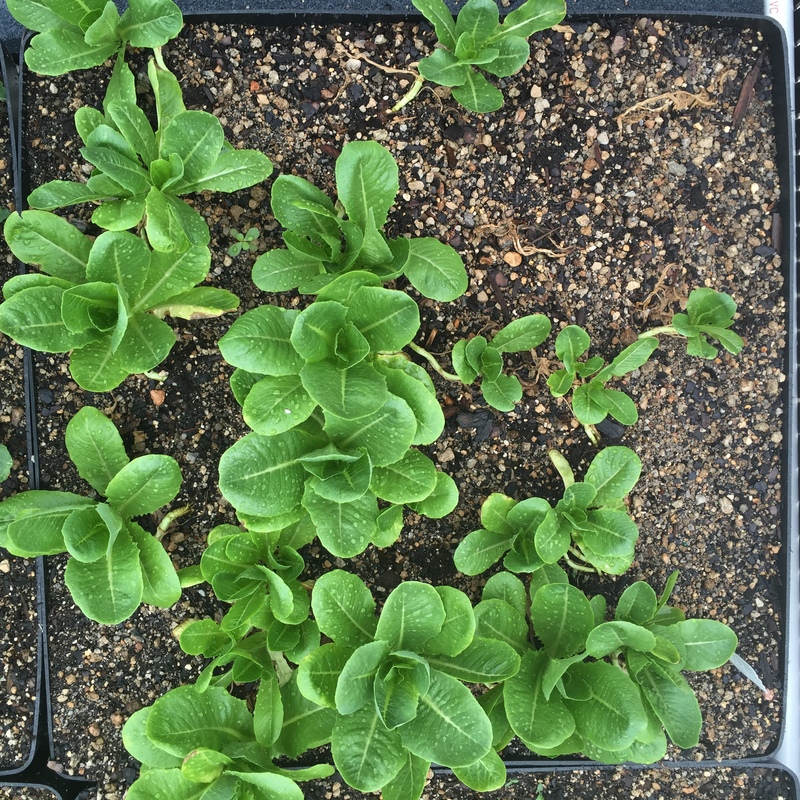 Prof. Merrill helped us arrange the layout of different crop species and we took off the outside plastic packings of transplanted crops, burying the roots under the topsoil. Talking about the most difficult part, I think it is to install the irrigation system. I didn’t participate in that part, but I saw my teammates tried to connect the pipe with water source, cut the pipe according to the dimensions of modules, used nodes to connect pipes with chemical glues. Finally, four irrigation nozzles were set up around the crop modules. The nozzle radius is suitable for the site, but one full-nozzle should be replaced with half-nozzle. Another type of plants we want to grow is succulent plant. So we also had a discussion about the appropriate species for roof planting and before that we each people had a suggestion list. 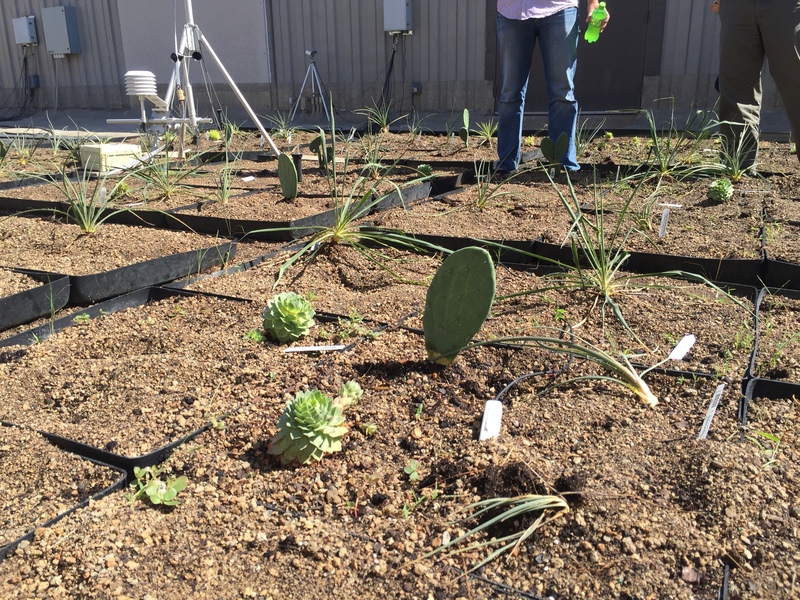 I proposed 6 succulent plants, and I feel so honored that 4 of them had been chosen for growing on the roof, which include Sedum palmeri, Graptopetalum paraguayense, Opuntia cacanapa ‘Ellisiana’, and Euphorbia resinifera. Many other succulent plants are also proposed, such as Nolina macrocarpa, Hesperaloe parviflora, Sempervivum ‘Carmen’, and Agave colorata x parryi and so on. We spent much time on arranging and distributing them in a well-organized and good visual-effect way. We made the short plants as ground cover distributed around the tall plant in the center. The same species are arranged together forming a group. My name is Chenni Zhu, a third-year MLA student. 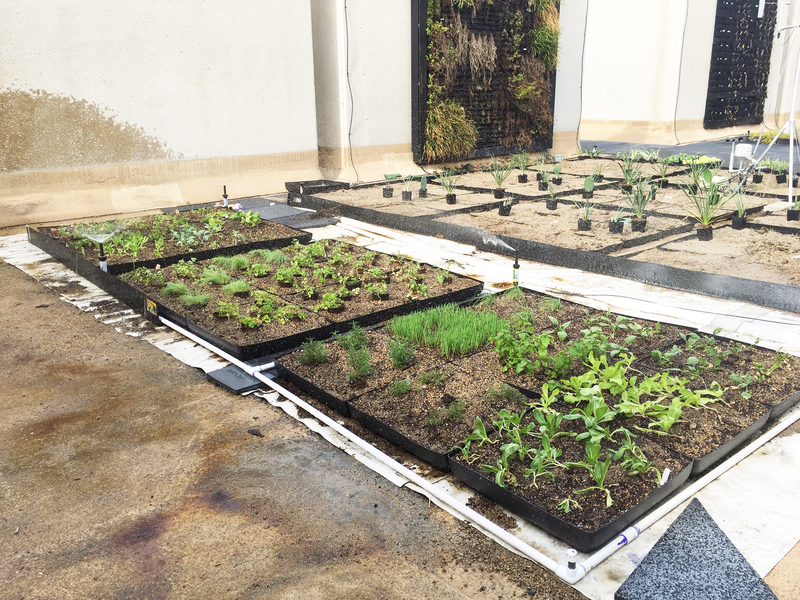 On the first day we went up to the roof garden, what we were required to do is to remove invasive weeds and pick up mature fruits of some crops such as tomatoes, shallots in the nine modules on the ground. Then we need to weigh the fruits from crops and record the numbers. And I feel what a pity that most of crops grown on the roof in summer are dead for these one or two months. It may be due to the harsh weather which is too hot and dry without frequent precipitation in Texas. So on the first day, we almost removed all of the weeds in the nine modules. However, what we saw in the next week surprised us that many weeds had grown up again in the modules due to a rain in that week. Thus, we had to weed them again to ensure there is no chance that these weeds would come up again. I have to say that the invasive weeds are really strong and capable of establishing themselves in prevailing conditions without manual intervention, while we should take more care to crops. After weeding, we were required to discuss what kinds of crops are capable of living on the roof top and surviving well. 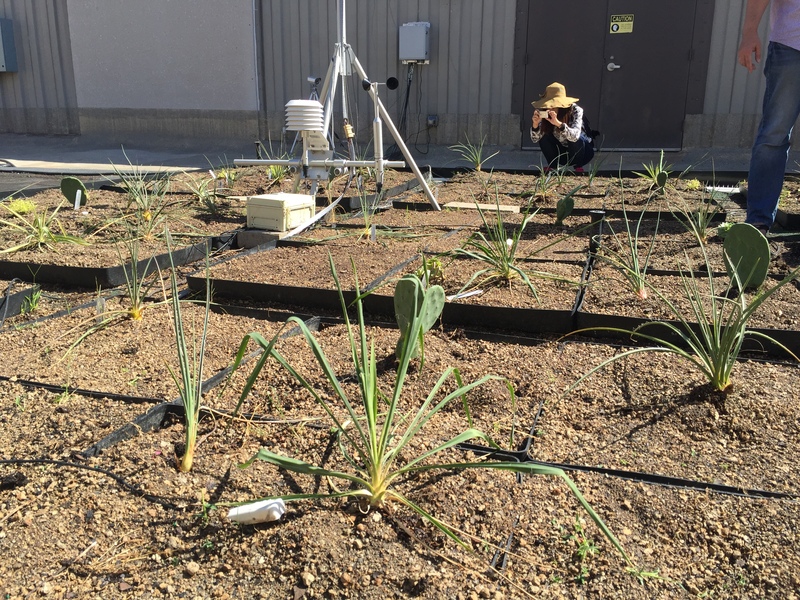 A study about “Assessing Crop Viability for Agricultural Production on Extensive Green Roofs” provided us with some statistics about which crops are suitable for growing on the roof in Texas. 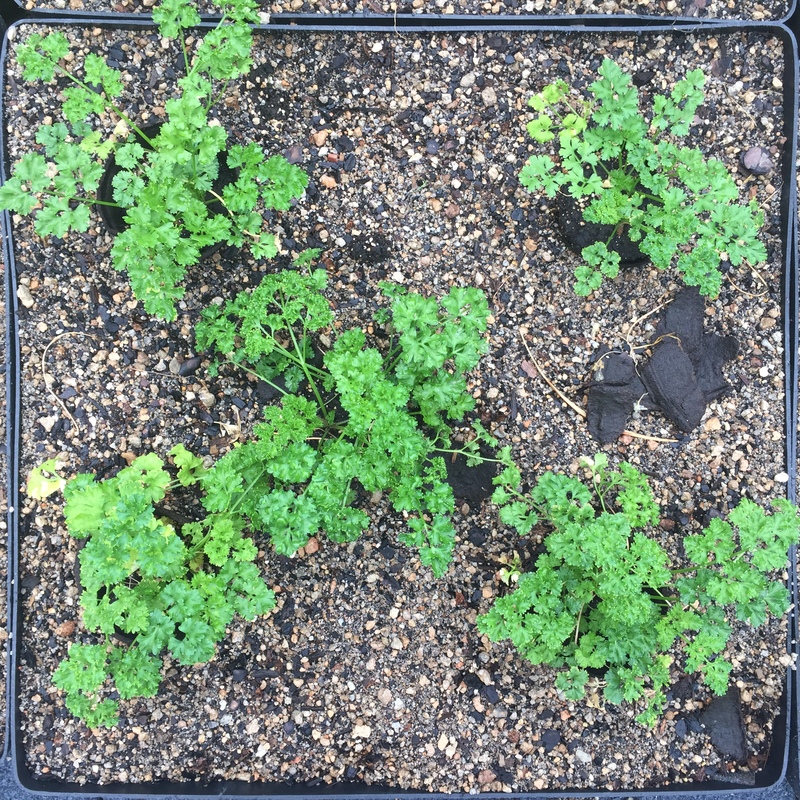 The evidences showed that the strong survivors (80 %+) include Chives, Cilantro, Parsley, Thyme and Mint among transplants. 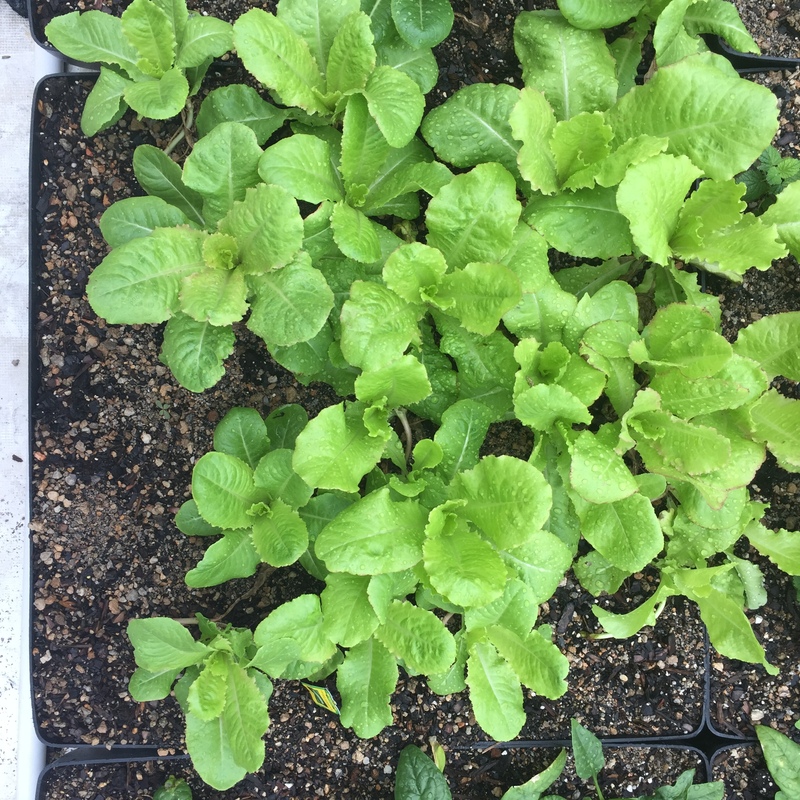 Moreover, among direct seeded crops, strong survivors include Arugula, Garlic, Kale, and Shallots. On the other hand, every team member was required to provide a list of suitable crops for growing on roof. So based on the study and the information I collected, I think the Arugula, Chives, Cilantro, Mint, Shallots and Thyme are ideal crops surviving on the roof. After that, we discussed the final crop species and basic layout of them according to the visual effect of combination of crops, the different demands on water amount of different crops, and numbers of crops. Below shows the later situation of some crops we grew on the roof. Most of them are in a good condition.